DTCM had to apply disclaimers to all outgoing email signatures. With no official email policy in place, employees had been creating disclaimers that were not legally compliant. Exclaimer Signature Manager Exchange Edition added disclaimers directly from DTCM’s Exchange server based on rules the IT department set for internal and external emails. Set up in 1997 to replace the Dubai Commerce and Tourism Promotion Board (DCTPB), the Department of Tourism and Commerce Marketing (DTCM) is the principal authority for the development of the tourism industry in Dubai. It implements an integrated programme of publicity activities and is responsible for the licensing and classification of all the region’s tourism services. With the ultimate vision of positioning Dubai as the world’s leading tourism destination and commercial hub, DTCM’s mission is to increase awareness of the city to global audiences and to attract more tourists into the Emirate. DTCM encourages foreign trade with Dubai through events, promotions, marketing campaigns and other activities. As part of its corporate role, it also issues legislation, instructions and policies to regulate the region’s tourism industry. For the Department, protecting all employees and the organization from any litigation has always been of vital importance, requiring the need for legal disclaimers on all outgoing emails. With the number of email laws in place across the world, the organization had a responsibility to ensure total compliance. However, upon an internal audit of employee email signatures, a number of problems quickly surfaced. Different teams who had requested to have the main corporate disclaimer adjusted had started creating their own versions, while other staff members using mobile devices had been sending emails which did not have one added. Simply put, too many signatures on outgoing emails did not have a legally compliant email disclaimer, with employees unaware that they were potentially putting the organization at risk of legal action. Exclaimer Signature Manager Exchange Edition made generating complex Active Directory-based disclaimers a snap. Enforcing an email disclaimer policy was urgently required. The problem was that the time and resources needed were estimated to take up a great deal of IT manpower and there was a danger that employees would still make their own modifications without permission. It was clear that DTCM needed a dedicated solution that would ensure every email had an appropriate disclaimer that could not be changed by employees manually. The IT department decided on Exclaimer Signature Manager Exchange Edition due to its ability to define different policies for different users, allowing for easy distribution of disclaimers for every email address in the organization. “We were amazed at the ease of installation and the support we received from Exclaimer,” stated Shafeeq Hamza, Senior IT Specialist at DTCM. “We explained what we needed the software to do and we genuinely felt that we were getting the best solution available.” As the disclaimers are added at the server, no employee would be able to delete or tamper with them, meaning legal compliance would be totally assured. Every employee would be assured of having an authorized disclaimer, no matter where they were located, with full HTML signatures to maintain a consistent brand identity. This was important for all employees who worked remotely or communicated to end-users via smartphones and tablet PCs. With installation completed and the first disclaimer created, the IT department decided to go further with Signature Manager Exchange Edition. Internal email signatures were set with only a phone extension while the marketing and legal teams were given slightly varied disclaimers, tailored to meet their requirements. The software managed to ensure that all parties concerned were satisfied with the outcome of this project. 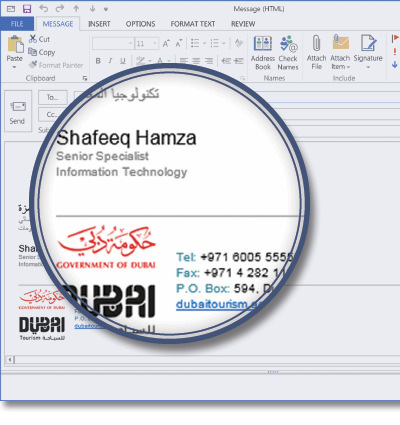 As an organization that has a strong corporate reputation to uphold, not just in the UAE but globally, having control over email disclaimers was a significant step to protect DTCM from being in breach of any email legislations. With control taken away from employees and all signatures centrally applied within Exchange, the software gave the organization increased security and peace of mind.